This is on Sunday, February 18th. Some improvements have been made since last year and with reasonable weather it should be a great event. 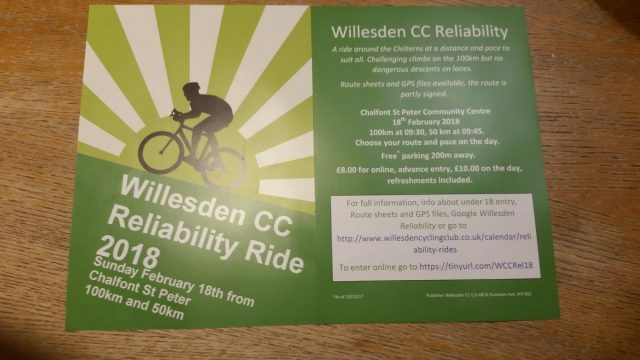 It is an open event and Willesden CC members have no priority for places. Insurance limits the event to 200 riders. Last year we got over 100 ,with negligible publicity, since it was launched very late in the day following the passing away of Mike Ellison, who was running the event before me. This year it will be much better publicised and the intention is to sell out, so you may wish to register soon. Oliver, with a note giving the name and email address or phone number of each entrant. The cheque must arrive no later than Monday 5th February and entrants paid for this way must be club members. I will be leaving an allocation of spaces for this which should be enough to give everyone doing it this way a place. You will need to fill out a form with some personal details at the ride start. My address is 68 St Dunstans Ave, London W3 6QJ.